I wanted to wish you all a merry Christmas and a happy New Year! I am going to spend the holidays with my family; hopefully there will be lot of snow in southern Germany! Microsoft's Automotive Business Unit will be presenting the latest version of the Microsoft Auto platform together with a variety of partner solutions at two events next year. @ Embedded World you will be able to find out everything you always wanted to know about MS Auto 3.1 and also get some insight into what is coming next with MS Auto 4.0. Additionally they will be showing several different partner solutions based on the platform, like EB's street director and EB's Guide suite. If you are more interested in seeing a prototype of a next-generation Infotainment system then, in this case, CeBit is the place to be. today I want to talk about a common problem you might run into when cloning a module to your platform. As you might know, the RELEASETYPE macro in the SOURCES file indicates the location of the output file but sometimes you simply forget to change this macro accordingly or don’t know what the correct setting would be. One way to ensure the correct location of your output file would be to specify the RELEASTYPE macro only in the SOURCES.CMN file and not in the SOURCES file of each individual module in your platform. I am sure you’ve all experienced this problem once in a while: you are debugging your Windows CE system, you are starting a remote tool but the connection somehow doesn’t establish or fails! So what do you do now? No matter how often you retry you will never get a connection to the remote tool. You might try to restart your Platform Builder and if that doesn’t help restart your machine but that’s just annoying and time consuming! A better solution would be to open the task manager on you development machine, go to the processes tab and kill the cemgr.exe (CE Manager). If you now restart the remote tool, it should connect and work! 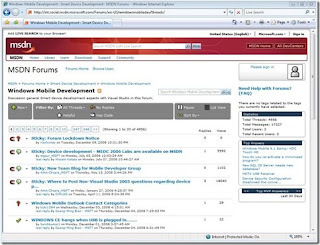 Do you know the Windows Mobile Development forum? do you already know the Windows Mobile Development forum? Not only the new UI makes it very valuable to all Windows Mobile developer. All you have to do is: check this out!!! If you are in Israel tomorrow, December 17th, don’t miss the free Windows Embedded OEM Technical Seminar and Workshop! It is intended for technical decision makers and developers. MS will show you the latest innovations in embedded software development, present the Microsoft Embedded Products as well as their development tools and give you the opportunity to ask questions about everything. Looking for a strong official Training Partner for Windows Embedded Standard? The successor of the previous Windows XP Embedded is called Windows Embedded Standard. Both solutions allow to go embedded on x86 architectures (only). While Windows CE is targeting ARM, MIPS, SH4 and x86, too, the x86 on Windows CE does not support Hyperthreading, e.g., like available on Intel's Atom processors which became a hype during the last months as you surely know following the news. So at least here going embedded using Microsoft solutions means going Windows Embedded Standard. During the next few weeks the official training material from Microsoft will be finished and released. Early support for interested customers in upcoming Windows Embedded Standard projects is already available since Microsoft already delivered the training material to interested offically certified trainers for reviewing purpose. In any case the linker will always use the first version of particular function that it finds. Sometimes you want to remove files from a CE image for example to save ROM/RAM space or because you do not want to support a certain functionality. Usually, the right way is to remove the related feature from the OS design. But there are circumstances where a catalogue feature adds several files and you do not want them to be included. Here comes a little batch file and additional bib file which will do all the work. rem -- declare items to remove with "; @BIBREMOVE "
Pleas let me know if you have any questions or suggestions. In this post I want to talk a little about the AUTOSIZE macro which can be used in the CONFIG section in the config.bib file. But let’s start with the MEMORY section which can also be found in your platforms config.bib file. Here are, amongst others, the defines for where your image will run (NK) and where your images RAM will be located (RAM), of course none of the regions defined here should overlap or else it is possible to overwrite your own memory and crash your system. Initially, the memory regions for NK and RAM are fixed up as you set them up here; hence you might waste some memory at the top of the NK region as your image might not be exactly as large as you defined the NK region to be. This is where the AUTOSIZE macro in the CONFIG section comes into play: it increases the RAM of your image by the unused size of your NK region. But why am I telling you this? You can easily find this in the MSDN! X-Mas is comming and the latest Windows CE updates have been recently released and are available for download. Especially the fixes for Windows CE 6.0 are very important. Download this set of updates for Windows CE 5.0 Platform Builder released during the period of November 1 - November 30, 2008. These updates are fixes for Windows CE operating system problems you run into during the development and maintenance of your custom platform. 081125_KB959619 - This update addresses an issue that may occur if a request comes from a device with 255 characters long name. 081117_KB958010 - This update addresses a number of Internet Explorer issues. Download this set of updates for Windows Embedded CE 6.0 released during the period of November 1 - November 30, 2008. These updates are fixes for Windows Embedded CE operating system problems you run into during the development and maintenance of your custom platform. 081125_KB959618 - This update addresses an issue that may occur if a request comes from a device with 255 characters long name. 081113_KB957901 - Windows Server 2008 may not respond to Dhcpv6 packets sent by Windows Embedded CE 6.0 device. 081114_KB959374 - This fix addresses the issue with incorrect validation of overlay's constant alpha value. 081124_KB959480 - This update addresses an issue with choppy audio and video when streaming 4 mbps or higher content over MMS or HTTP. 081117_KB958070 - This update addresses a number of Internet Explorer issues. 081105_KB959247 - Warning messages cannot be turned off in ship builds. 081113_KB959877 - Deadlock may occur when two threads with different priority share the lock. 081124_KB959416 - This update adds ioctl function to set/get a new status "suspended". 081110_KB958805 - This update addresses the issue with Heaplist CEDebugX extension returning an error. 081124_KB959879 - Platform Builder 6.0 may be reading uncommited memory pages. With this update, Platform Builder 6.0 will check to make sure the valid bit is set on the page table entry. In this case your driver will still be built and included in your image. In oder to fix the catalog item view all you need to do is get rid off the module definition in your catalog item file. Et voilá, now the catalog item will no longer be displayed as excluded from build. in my earlier post, I gave you a few hints on how to get the new Windows Embedded CE 6.0 R2 VoIP application suite working. But you might find that by default only the US phone number dial plan is supported. So what do you need to do in order to place a call if you do not live in the US or don’t want to call a US number? Well the dial plan is defined in an .xml file which you can find under _WINCEROOT\PUBLIC\FP_VOIP\OAK\FILES\ipdialplan_fpvoip.xml. All you need to do is alter that file accordingly. just a quick reminder: the next MS technical chat on Windows Embedded Standard takes place tomorrow, check out Haralds’ post for more details. in case you are looking for a good and extensive description of the changes in application development under Windows CE 5.0 to application development under Windows Embedded CE 6.0 have a look at this article on the Windows CE Base Team Blog written by Upender R. Sandadi. What is new in MS Auto 3.1? Microsoft Auto 3.1 is the latest release in Microsoft’s leading automotive focused software platform. It is built on top of Windows Embedded CE 6.0 R2. If you need more information, then just take a look here. 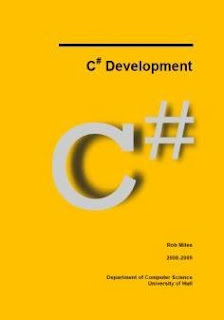 Rob Miles has released his C# "Yellow book". It is free availabele to download. It is a very nice book about C# developement and programming technics. You can download it here. If you can't get enough about C# and if you interessed in .Net Microframework, then I have another hint for you! MS is hosting a live chat on, December 16th, regarding Windows Embedded CE and Windows Mobile. Description:Do you have tough technical questions regarding Windows Embedded CE or Windows Mobile for which you're seeking answers? Do you want to tap into the deep knowledge of the talented Microsoft Embedded Devices Group members? If so, please join us for a live chat and bring on the questions! Windows Embedded CE is the operating system that is powering the next generation of 32-bit, small-footprint and mobile devices. This chat will cover the tools and technologies used to develop devices using the CE operating system. As with all other macros in SOURCES or DIR files, a “\” character denotes that the list for the particular macro continues in the next line. Be careful not to use any other character after the “\” character otherwise the list will NOT continue in the following line. A whitespace character after the “\” character is a common and hard to trace bug in this context. There is one more restriction you need to be aware of when using the SOURCES macro. You can only specify files in the same directory as the SOURCES file (e.g. SOURCES=myFile.c) or files that are one directory up from the SOURCES file (e.g. SOURCES=..\myOtherFile.c). Every other file will not be taken into account and produce an error when building your module. NOTE: This restriction does not apply to the assembly file macros such as ARM_SOURCES, SH_SOURCES, x86_SOURCES or MIPS_SOURCES. Well, how to customize the background image on Windows CE Desktop? I've seen quite a few times now and it seemed the most intuitive way for me, too, to first search for the background image file coming from Microsoft. But what to do then? 1.) First alternative coming to everybody's mind is to substitute the background image file. The file is named windowsce_vgal.jpg and is placed in _PLATFORMROOT\<BSPNAME>\Files After testing you hopefully have IMAGING_IMG_JPEGDECODER enabled, too. Otherwise you will find out that there is a windowsce_vgal.bmp that has to be sustituted then. This was quite easy but since you used the same file naming in your project compared to Microsoft's original file naming it's hard to see or recognize that the substitution took place. Especially if you'll just look at the sources a few month after the changes. Then you'll really need an image viewer to recognize the replaced images. So is there a better way to do this? and probably introduce an own environment variable or feature variable as a catalogue item to wrap this line(s) with some controling IF ELSE ENDIF statements. Now you did not touch the original background image from Microsoft and inside your repository your background image file has a meaningful file name. A few month later looking into your repository you will have a good chance to recognize the customization now. 3.) Now is there a third alternative even better? Why not use your own file name even inside your nk.bin image? So some of your bib files contains, e.g. ; @CESYSGEN IF IMAGING_IMG_JPEGDECODER "wallpaper"="\Windows\WindowsCE.jpg"
might do the trick then. And again customization control can be added by feature variables and catalogue items. Transparency for others or while time goes by is surely higher compared to the two alternatives before.